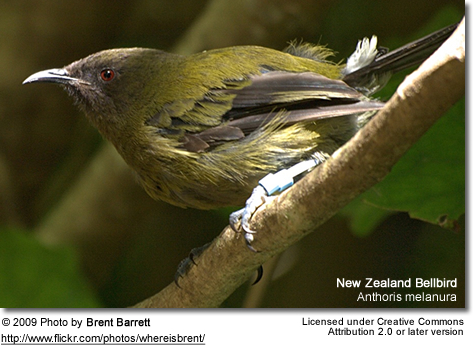 The New Zealand Bellbird Anthoris melanura is a passerine bird that is endemic to New Zealand, and is commonly known simply as the 'bellbird'. It is known to the M?ori as Korimako. It has a bell-like song which is sometimes confused with that of the tui. 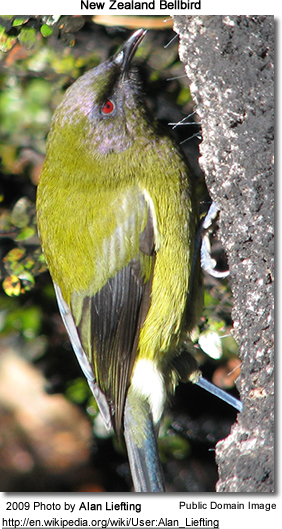 The bellbird is endemic throughout both the main islands of New Zealand but its population and dispersion has been seriously affected by the introduction of European-style farming, which has led to the removal of native forests (the natural habitat of the bellbird) and the introduction of predatory species such as cats, weasels, stoats, ferrets, rats and food-robbing species like wasps. Predators either eat the birds or consume eggs, while food robbers compete with the bellbird for its natural food sources of nectar, honeydew and insects. Notwithstanding the ecological pressures created by the above factors, the bellbird persists in areas of relatively undisturbed native forests, whilst conservation activity from the 1920's has endeavoured to protect and promulgate the species. This has especially been the case in island enclaves that have been freed of predators. 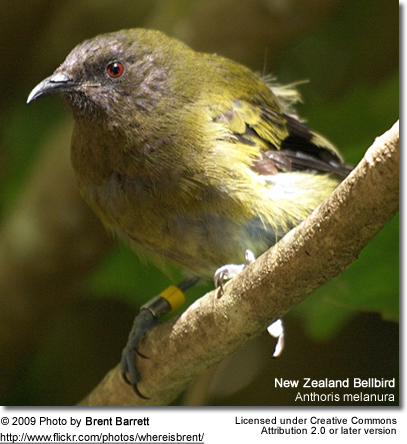 The Chatham Island Bellbird, A. melanocephala, which became extinct in the early 20th century, was formerly classified as a subspecies of the New Zealand Bellbird, as A.melanura melanocephala. It has greenish coloration and is the only living member of the genus Anthornis. 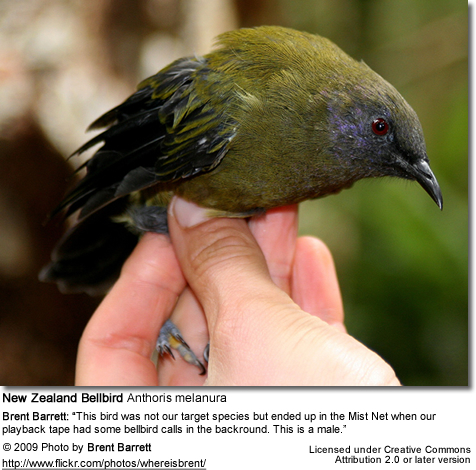 The closely related Chatham Island Bellbird, Anthornis melanocephala, which became extinct in the early 20th century, was formerly considered another subspecies, as A. m. melanocephala. 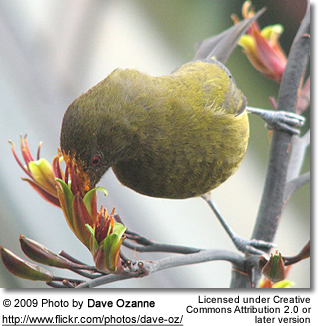 The bellbird forms a significant component of the famed New Zealand dawn chorus of bird sounds that was much noted by early European settlers. The sound of the bellbird is included as one of the iconic bird sounds in the national radio programme of Radio New Zealand as played on early morning news programmes since about 1972.